At the HMI Research Center, we have found that the heart plays a central role in the generation of emotional experience and therefore, in the establishment of psychophysiological coherence. From a systems perspective, the human organism is truly a vast, multidimensional information network of communicating subsystems in which mental processes, emotions and physiological systems are inextricably intertwined. Whereas our perceptions and emotions were once believed to be dictated entirely by the brain’s responses to stimuli arising from our external environment, the emerging perspectives in neuroscience more accurately describe perceptual and emotional experience as the composite of stimuli the brain receives from the external environment and the internal sensations or feedback transmitted to the brain from the bodily organs and systems. [5, 79] Thus, the heart, brain, nervous, hormonal and immune systems must all be considered fundamental components of the dynamic, interactive information network that determines our ongoing emotional experience. Extensive work by Pribram has helped advance the understanding of the emotional system. In Pribram’s model, past experience builds within us a set of familiar patterns that are established and maintained in the neural networks. Inputs to the brain from both the external and internal environments contribute to the maintenance of these patterns. Research has shown that the heart’s afferent neurological signals directly affect activity in the amygdala and associated nuclei, an important emotional processing center in the brain. The amygdala is the key brain center that coordinates behavioral, immunological and neuroendocrine responses to environmental threats. It also serves as the processing center for emotional memory within the brain. In assessing the external environment, the amygdala scans the inputs (visual, auditory, smell) for emotional content and signals and compares them with stored emotional memories. In this way, the amygdala makes instantaneous decisions about the familiarity of incoming sensory information and because of its extensive connections to the hypothalamus and other autonomic nervous system centers is able to "hijack" the neural pathways activating the autonomic nervous system and emotional response before the higher brain centers receive the sensory information. One of the functions of the amygdala is to organize which patterns become "familiar" to the brain. If the rhythm patterns generated by the heart are disordered and incoherent, especially in early life, the amygdala learns to expect disharmony as the familiar baseline and thus we feel "at home" with incoherence, which can affect learning, creativity and emotional balance. In other words we feel "comfortable" with internal incoherence, which in this case actually is discomfort. On the basis of what has become familiar to the amygdala, the frontal cortex mediates decisions as to what constitutes appropriate behavior in any given situation. Thus, subconscious emotional memories and associated physiological patterns underlie and affect our perceptions, emotional reactions, thought processes and behavior. From our current understanding of the elaborate feedback networks between the brain, heart and mental and emotional systems, it becomes clear that the age-old struggle between intellect and emotion will not be resolved by the mind gaining dominance over the emotions, but rather by increasing the harmonious balance between the mental and emotional systems – a synthesis that provides greater access to our full range of intelligence. Within the body, many processes and interactions occurring at different functional levels provide constant rhythmic inputs with which the brain becomes familiar. These inputs range from the rhythmic activity of the heart and our facial expressions, to digestive, respiratory and reproductive rhythms, to the constant interplay of messenger molecules produced by the cells of our body. These inputs to the brain, translated into neural and hormonal patterns, are continuously monitored by the brain and help organize our perception, feelings and behavior. Familiar input patterns from the external environment and from within the body ultimately are written into neural circuitry and form a stable backdrop, or reference pattern, against which current and new information or experiences are compared. According to this model, when an external or internal input is sufficiently different from the familiar reference pattern, this "mismatch" or departure from the familiar underlies the generation of emotions. The background physiological patterns with which the brain and body grow familiar are created and reinforced through life experiences and the way we perceive the world. It’s important to note that the established patterns may not necessarily be positive or healthy for a person. For example, someone living in an environment that continually triggers anger or feelings of fear is likely to become familiar with these feelings and their neural and hormonal correlates. In contrast, an individual whose experience is dominated by feelings of security, love and care likely will become familiar with the physiological patterns associated with these feelings. In order to maintain stability and feelings of safety and comfort, we must be able to maintain a match between our current experience or "reality" and one of our previously established neural programs. When we encounter a new experience or challenge, there can be a mismatch between the input patterns of the new experience and the lack of a familiar reference. Depending on the degree of mismatch, it requires either an internal adjustment (self-regulation) or an outward behavioral action to reestablish a match and feeling of comfort. When a mismatch is detected from either external or internal sensory systems, a change in activity in the central and autonomic nervous systems is produced. If the response is short-lived (one to three seconds), it is called arousal or an orienting reflex. If, however, the stimulus or event is recurrent, the brain eventually adapts and we habituate by updating the memories that serve as the reference. For example, people who live in a noisy city adapt to the ambient noise and eventually tune it out. Subsequent to this adaptation, it is only when they take a trip to the quiet countryside that the actual lack of noise seems strange and is quite noticeable. The mismatch between the familiar noisy background and the quiet setting leads to an arousal reaction that gets our attention. It is this departure from the familiar that gives rise to a signaling function that creates the experience of an emotion, alerting us to the current state of the mismatch. In addition to the monitoring and control processes for regulation "in the here-and-now," there are also appraisal processes that determine the degree of consistency or inconsistency between a current situation and the projected future. Appraisals of future outcomes can be broadly divided into optimistic and pessimistic. Appraisals that project an inability to successfully deal with a situation may result in feelings of fear and anxiety. In keeping with the recent research on attentional bias, this appraisal might not be accurate because it could be the result of hypersensitivity to cues that resemble past traumatic experiences in the current situation. Alternately, an inaccurate appraisal can be caused by an instability in the neural systems, or a lack of experience or insight of how to effectively deal with the projected future situation. Despite the lack of accuracy of the appraisal, the familiarity of the input can be sufficient to elicit a pessimistic response. This means we can easily get "stuck" in unhealthy emotional and behavioral patterns and lasting improvements in emotional experience or behaviors cannot be sustained in the absence of establishing a new set point for the baseline. If behavior change or improved affective states are desired, it is therefore critical to focus on strategies that help to establish a new internal reference. As we successfully navigate new situations or challenges, the positive experience updates our internal reference. In essence, we mature through this process as we learn to more effectively self-regulate our emotions and deal with new situations and challenges. It is through this process that we are able to develop a new, healthier internal baseline reference against which we match inputs so that our assessments of benign inputs are more accurate and result in feelings of safety and comfort rather than threat and anxiety. In a study of high school students who practiced self-regulation techniques over a four-month period, their resting HRV was significantly increased and the pattern of the HRV was significantly more coherent (Figure 5.1). These improvements in resting HRV coherence were significantly correlated with higher test scores and improved behaviors, suggesting that the practice of the self-regulation skills induces a more coherent heart rhythm, reinforcing the association in the sub-subcortical regulatory systems involved in a match/mismatch process between more coherent and stable rhythms in cardiovascular afferent neuronal traffic and feelings we perceive as positive. By reinforcing this natural coupling in the sub-subcortical regulatory systems, the self-activation of a positive feeling can automatically initiate an increase in cardiac coherence, while at the same time, a physiological shift resulting from heart-focused breathing can help facilitate the experience of a positive emotion. Figure 5.1 Typical resting state heart rate variability patterns in students. HRV recordings from the TestEdge National Demonstration Study showing examples of two students’ resting-state heart-rhythm patterns, both before and approximately four months after the TestEdge intervention. 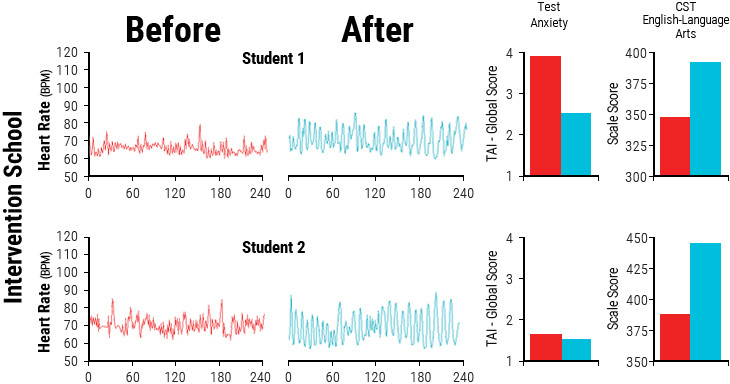 Pre- and post-intervention test anxiety level (TAI-Global Scale score) and the CST-English Language Arts test score for each student are also shown. For the two students in the intervention school, the recordings show a shift from an erratic, irregular heart-rhythm pattern (left side), before the intervention, to a more coherent pattern (right side), which indicates the students had established a new more coherent baseline. Pribram and many others have conducted numerous experiments that provide evidence that the higher brain centers that monitor the pattern-matching process can self-regulate by inhibiting or "gating" the information flowing into the brain. Where we focus our attention, for example, has a powerful effect on modulating inputs and thus on determining what gets processed at higher levels. In a noisy room filled with many conversations, for instance, we have the ability to tune out the noise and focus on a single conversation of interest. In a like manner, we can modulate pain from a stubbed toe or headache or desensitize ourselves to sensations like tickling and self-direct our emotions. Ultimately, when we achieve control through the process of self-regulation, it results in feelings of satisfaction and gratification. In contrast, failure to effectively self-regulate and regain control often results in feelings of frustration, impatience, anxiety, overwhelm, hopelessness or depression. Neural inputs originate from numerous organs and muscles, especially in the face. The heart and cardiovascular system, however, have far more afferent inputs than other organs and are the primary sources of consistent dynamic rhythms. In addition to afferent nerve activity associated with mechanical information such as pressure and rate that occurs with each heartbeat, continuous dynamically changing patterns of afferent activity related to chemical information is sent to the brain and other systems in the body. In terms of emotional experience, there are afferent pathways to the amygdala via the nucleus of tractus solitarius and the activity in the central nucleus of the amygdala is synchronized to the cardiac cycle. [10, 177] Therefore, the afferent inputs from the cardiovascular system to the amygdala are important contributors in determining emotional experience and in establishing the set point to which the current inputs are compared. In the context of this discussion, it is important to note that the heart’s rhythmic patterns and the patterns of afferent neurological signals change to a more ordered and stable pattern when one uses HeartMath’s heart-focused self-regulation techniques. Regular practice of these techniques, which include a shift of attentional focus to the center of the chest (heart area) accompanied by the conscious self-induction of a calm or positive emotional state, reinforces the association (pattern match) between a more coherent rhythm and a calm or positive emotion. Positive feelings then more automatically initiate an increase in cardiac coherence. Increased coherence initiated through heart-focused breathing tends to facilitate the felt experience of a positive emotion. Thus, practice affects the repatterning process. This is important in situations where there has been a sustained exposure to truly high-risk environments or trauma in the past, but which no longer are in effect and the patterns that developed in response to them no longer serve the individual in present safe environments. Through this feed-forward process, regulatory capacity is increased and new reference patterns are established, which the system then strives to maintain, making it easier for people to maintain stability and self-directed control during daily activities, even in more challenging situations. Without a shift in the underlying baseline, it is exceedingly difficult to sustain behavioral change, placing people at risk of living their lives through the automatic filters of past familiar experience. With stress levels continuing to rise around the world, people are becoming more conscious not only of the long-term effects of stress, but also of how unmanaged emotions compromise the quality of one’s day to-day life, limiting mental clarity, productivity, adaptability to life’s challenges and enjoyment of its gifts. While this is true for many people who have not developed their self-regulation skills, our research and experience show that the emotional system can be regulated and brought into coherence. This, of course, requires practice and effective skills, in much the same way that it takes techniques and practice to learn and develop mental or athletic skills. The research on heart-brain interactions and intuition has informed the development of a set of selfregulation techniques and practices, the learning of which can be supported with the use of HRV coherence feedback technologies, collectively known as the HeartMath System. [178-182] The HeartMath System offers individuals a systematic and reliable means to intentionally self-regulate and shift out of a state of emotional unease or stress into a "new" positive state of emotional calm and stability. This occurs as a result of a practice in which an individual intentionally activates a positive or calm emotional state as a future target and activates a shift in patterns of the heart’s activity to a more coherent state that enables the person to achieve and maintain stability and emotional composure. The techniques are designed to enable people to intervene in the moment when negative and disruptive emotions are triggered, thus interrupting the body’s normal stress response and initiating a shift toward increased coherence. This shift facilitates higher cognitive functioning, intuitive access and increased emotional regulation, all of which normally are compromised during stress and negative emotional states. The shift in the pattern of the heart’s input to the brain thus serves to reinforce the self-generated positive emotional shift, making it easier to sustain. Through consistent use of HeartMath tools, the coupling between the psychophysiological coherence mode and positive emotions is further reinforced. In addition to clinical applications, HRV coherence feedback training often is used to support self-regulation skill acquisition in educational, corporate, law enforcement and military settings. Several systems that assess the degree of coherence in the user’s heart rhythms are available. The majority of these systems, such as emWave® Pro or Inner Balance® for iOS devices (HeartMath, Inc.), Relaxing Rhythms (Wild Divine) and the Stress Resilience Training System (Ease Interactive), use a noninvasive earlobe or finger pulse sensor and display the user’s heart rhythm to provide feedback on the user’s level of coherence. Emotional self-regulation strategies may contribute to improved health and performance. Alone or in combination with HRV coherence biofeedback training, these strategies have been shown to increase resilience and accelerate recovery from stressors and trauma. [53, 58, 81, 190] Self-induced positive emotions can initiate a shift to increased cardiac coherence without any conscious intention to change the breathing rhythm. [51, 133] Typically, when people are able to self-activate a positive or calming feeling rather than remain focused on their breathing, they enjoy the shift in feeling and are able to sustain high levels of coherence for much longer time periods. Heart-focused self-regulation techniques and assistive technologies that provide real-time HRV coherence feedback provide a systematic process for self-regulating thoughts, emotions, behaviors and increasing physiological coherence. Many of these techniques (e.g., HeartMath’s Heart-Focused Breathing, Freeze Frame, Inner Ease and Quick Coherence techniques are designed to enable people to intervene in the moment they start to experience stress reactions or unproductive thoughts or emotions. With practice, one is able to use any of the techniques to shift into a more coherent physiological state before, during and after challenging or adverse situations, thus optimizing mental clarity, emotional composure and stability. The first step in most of the techniques developed by the HeartMath Institute is called Heart-Focused Breathing, which includes placing one’s attention in the center of the chest (the area of the heart) and imagining the breath is flowing in and out of the chest area while breathing a little slower and deeper than usual. Conscious regulation of one’s respiration at a 10-second rhythm (five seconds in and five seconds out) (0.1 hertz) increases cardiac coherence and starts the process of shifting into a more coherent state. [5, 113] With conscious control over breathing, an individual can slow the rate and increase the depth of the breathing rhythm. This takes advantage of physiological mechanisms to modulate efferent vagal activity and thus the heart rhythm. This increases vagal afferent nerve traffic and increases the coherence (stability) in the patterns of vagal afferent nerve traffic. In turn, this influences the neural systems involved in regulating sympathetic outflow, informing emotional experience and synchronizing neural structures underlying cognitive processes. In addition to the self-regulation techniques that are primarily designed to be used in the moment, the Heart Lock-In Technique is more appropriate when one has more time to focus on sustaining a coherent state. It enables people to "lock in" the positive feeling states associated with the heart in order to boost their energy, heighten peace and clarity and effectively retrain their physiology to sustain longer periods of coherent function. With consistent practice, the Heart Lock-In facilitates the establishment of new reference patterns promoting increased physiological efficiency, mental acuity and emotional stability as a new baseline or norm. While the HeartMath tools are intentionally designed to be easily learned and used in day-to-day life, our experience working with people of diverse ages, cultures, educational backgrounds and professions suggests that these techniques often facilitate profound shifts in perception, emotion and awareness. Moreover, extensive laboratory research performed at HMI has shown that the physiological changes accompanying such shifts are dramatic. Several studies using various combinations of these self-regulation techniques have found significant correlations between HRV coherence and improvements in cognitive function and self-regulatory capacity. A study of middle school students with attentiondeficit hyperactivity disorder showed a wide range of significant improvements in short- and long-term memory, ability to focus and significant improvements in behaviors both at home and in school. A study of 41 fighter pilots engaging in flight simulator tasks found a significant correlation between higher levels of performance and heart-rhythm coherence as well as lower levels of frustration. A study of recently returning soldiers from Iraq who were diagnosed with PTSD found that relatively brief periods of HRV coherence training combined with practicing the Quick Coherence Technique resulted in significant improvements in the ability to self-regulate along with a wide range of cognitive functions. The degree of improvement correlated with increased cardiac coherence. Other studies have shown increases in parasympathetic activity (vagal tone), reductions in cortisol and increases in DHEA, decreases in blood pressure and stress measures in hypertensive populations,[113, 115] reduced health-care costs and significant improvements in the functional capacity of patients with congestive heart failure. A study of correctional officers showed reductions in systolic and diastolic BP, total cholesterol, fasting glucose, overall stress, anger, fatigue and hostility. Similar results were obtained in several studies with police officers. [53, 193]. In addition to the emotional self-regulation techniques, there are other approaches that also increase HRV coherence. For example, a study of Zen monks found that monks with greater experience in meditation tended to have more coherent heart rhythms during their resting recording than those who had been monks for less than two years. A study of autogenic training showed increased HRV coherence and found that cardiac coherence was strongly correlated with EEG alpha activity. The authors suggested that cardiac coherence could be a general marker for the meditative state. However, this does not suggest that all meditation or prayer styles increase coherence, unless the coherence state is driven by a focus on breathing at a 10-second rhythm or the activation of a positive emotion. [196-199] For example, a study examining HRV while reciting rosary or bead prayers and yoga mantras found that a coherent rhythm was produced by rhythmically breathing, but not by random verbalization or breathing. The authors ascribed the mechanisms for this finding to a breathing pattern of 6-cycles per minute. In a study of the effects of five types of prayer on HRV, it was found that all types of prayer elicited increased cardiac coherence. However, prayers of gratefulness and heartfelt love resulted in definitively higher coherence levels. It also has been shown that tensing the large muscles in the legs in a rhythmical manner at a 10-second rhythm can induce a coherent heart rhythm.